We hope to one day help other families who might be going through something like I did. 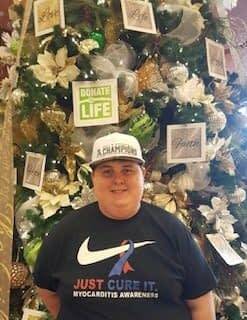 “My name is Andrew Hazlett, but I go by Drew, and my Myocarditis story all started in May of 2017 when I was 18 years old. My family all got sick with the flu and my little sister ended up with pneumonia. After everyone got better, I got sick again with coughing, sweating and shortness of breath at night, which required me to sleep sitting up. My parents thought I had pneumonia like my sister. possible fluid around my lungs. The doctor rushed me to Florida Hospital Orlando where they specialize in cardiac care. I was put on medications and lots of tests were done. I had a Swan Ganz Catheter put in my neck to monitor the pressures in my heart. I spent 2 weeks in the ICU and on the cardiac unit. During this time, it was my high school graduation. My school, Lake Nona High School in Orlando, coordinated with the hospital so that a live stream of the ceremony came into my hospital room and I could be a part of it. Even though my diagnosis was still a mystery I seemed to be getting better and went home with medications and an external defibrillator in the beginning of June. On June 13th I took a turn for the worse with an abnormally high heart rate and was rushed by ambulance back to Florida Hospital Orlando. At this time it was determined that I had cardiomyopathy caused by Myocarditis. Two days later after having another Swan Ganz Catheter put in my neck and a Balloon Pump in to help my heart I crashed and had to be placed on an ECMO machine (that would do the work for my heart and alow my heart to rest and heal) to save my life. I ended up in the CVICU (cardiovascular ICU) and remained on ECMO for 5 days. After that I had to be put on a BiVAD (BiVentricular Assist Device). This machine was a bridge to a heart transplant which required me to stay in the CVICU for over 80 days. I had the best nurses, doctors, surgeons and staff surrounding me. It was tough being a teenager hooked to lifesaving machines and living in a hospital for so long but I was blessed to have my friends, family and our community supporting me through it all. On August 20, 2017 we got the call that the perfect heart was found for me and my transplant began at 7:00 p.m. that evening. My new heart began beating at 12:04 a.m. on August 21, 2017 which was the same day as the solar eclipse. My mom said they sang “Total Eclipse of the Heart” to me. I had some complications post transplant, like extra fluid around my heart and lungs, and my other organs suffered from all the trauma of having 2 major open heart surgeries so close together. I ended up on dialysis and spent an additional 2 weeks in the CVICU. Once I got a little better I was transferred to the cardiac unit where I spent an additional week recovering. During this time Hurricane Irma came thru the state of Florida and since we were predicted to lose power my family and the hospital staff decided it was in my best interest to keep me in the hospital a couple extra days where they had back up generators if the storm got too bad. I finally came home on September 14, 2017 and have been getting better and stronger ever since. I have monthly biopsies, go to clinic, have labs drawn, attend cardiac rehab 3 times a week and take around 20+ life saving medications twice a day. My family and I are very grateful for my medical team, the donor’s family and everyone who supported us on this journey. We want to give back and do more to raise awareness about Myocarditis. We hope to one day help other families who might be going through something like I did.